Pigmented as well as albino rabbits weigh­ing between 2-2.5 Kg were used for this study. Pure cultures of E. coli and C. albicans were isolated from human material. Suspensions in saline were prepared corresponding to No. 10 tube of turbidometer. The suspensions were kept in boiling water bath for 30 minutes, cooled and centrifuged at 20,000 'g' for 30 minutes. The supernatant was used for intra­vitreal and suprachoroidal injections. Ultra­sonicated antigen of E. histolytica was obtai­ned from Microbiology Department of our Institute. The preparation had a protein content of 1.366 mg/ml. Intravitreal and suprachoroidal injections of the different extracts were given by anaes­thetizing the animals with intravenous injec­tion of sodium barbitone in a doze of 25mg/kg body weight. Xylocaine 4% was used for topical anaesthesia. Three such injections of different toxins used, were given at weekly intervals to the respective animal. All the animals were subjected to external, biomicroscopic and ophthalmoscopic examina­tion by dilating the pupils with homatropine 2% drops. The animals were examined twice a week for a period of 60 days. At the end of the period of observation, the animals were sacrificed by air embolism and aqueous was withdrawn by a tuberculin syringe with 26 gauge needle. The eyes were then enucleated and leas and vitreous were dissected out for further analysis. Lenses were homogenized in 5% trichloroa­cetic acid and the homogenate centrifuged for 30 minutes at 20,000 'g'. The supernatant was used for estimation of sodium and potassium and the pellet was dried at 60° C for 8 hrs and weighed. Lens water was calculated by dedu­cting the dry weight of pellet from the wet weight of lens as described by Barber, 1958. Serum, aqueous humour and vitreous body were used as such for sodium and potassium estimations. The sodium and potassium con­tents were determined by flame photometery. Reducing sugars were estimated in separate lenses by the method of Fplin and Wu as cited by Varley (1963). Examination of the animals after intravi­treal injections of 0.1 ml of saline, E. coli, C. albicans and E. histolytica extracts revealed no positive abnormalities in cornea, anterior chamber, iris and pupillary reflex. A mild to moderate conjunctival congestion was observed in all the animals at the site of injection which disappeared within 1-2 weeks. A mild to moderate vitreous flare was noticed in all the animals except the control group. The vitreous flare disappeared by 5th week in the C. albi­cans group but persisted in 50% animals in which E. colt and E. histolytica extracts were injected. The lenses remained clear in all the groups till the 5th week of first injection but at the end of 6th week, haziness of the poster­ior subcapsular region, in the eyes of rabbits given E. coli extracts, were seen. By the end of 8th week, granular opacities in the posterior sub-capsular region were seen [Figure - 1][Figure - 2] in eight out of ten eyes. No haziness or opacities were seen in the lenses of those eyes which were given intravitreal injections of C. albicans and E. histolytica extracts. Similarly, suprach­oroidal injections of different extracts did not show any change in cornea or signs of anterior uveitis. Conjunctival congestion subsided in 1-2 weeks and mild to moderate vitreous flare was present up to 8 weeks. However, in the E. histolytica group. the vitreous flare was seen in the initial stages. At the 6th week of observation a definite irregular opacity around the lens suture, granular in appearance with ill defined margins was seen in 4 out of 10 eyes in the E. coli group. By the end of 8th week two lenses showed haziness in the posterior sub­capsular region and four lenses showed a granular opacity. Our data on the contents of sodium in the lens, aqueous, vitreous and serum of control group shows a selective distribution of this cation in these tissues and body fluids [Table - 1] Similarly, potassium is not distributed in equal concentrations but does not follow the same distribution pattern as sodium. This becomes more evident when we compare the sodium: potassium ratio which is 39.74; 0.21; 33.82 and 26.72 fot the crystalline lens, aqueous humour, vitreous body and serum respectively. The contents of reducing sugars are very low in the vitreous followed by crystalline lens, aqu­eous and serum in the increasing order [Table - 1]. The contents of sodium in the crystalline lens are increased by about 2.6 and 3.2 times after intravitreal and suprachoroidal injections of E. coli extracts respectively. On the other hand, a decrease of about 23% in the sodium contents of vitreous is observed [Table - 1]. The potassium contents remain unaltered in all the tissues studied by us. 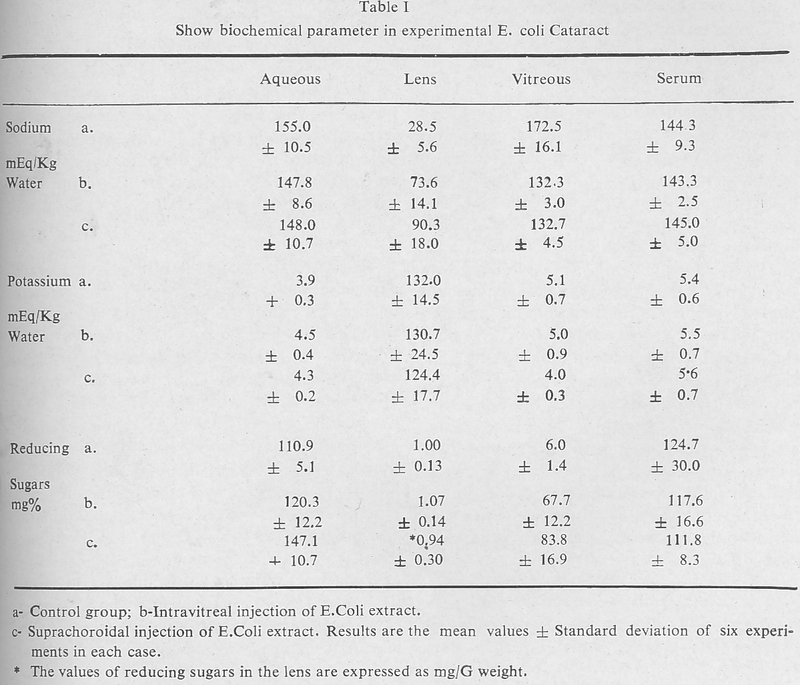 There is a slight increase in the contents of reducing sugars of aqueous humour and vitre­ous body but no statistically significant change is observed in the crystalline lens and serum of rabbits given either intravitreal or suprachoro­idal E. coli extract [Table - 1]. In the present study, we have undertaken the work to see the effect of various toxins from different organisms, each representing a class of bacteria, fungus and protozoae. This appeared important in view of the fact that among the patients with cataract seen in our lens clinic, positive stool examinations (paras­ites) were present in 48.7% of children with cataract where no other definite etiology could be found. However, in the group of children with cataract of known etiology, positive stool examinations were present in only 23.3% sub­jects. In cases of cataract having typical features of complicated cataract, it is not always possible to demonstrate a causative ocular pathology. Such cases may have a subclinical disease. However, it is also possible that in such cases the toxins liberated by organism present in the body act on the lens directly or indirectly through structures like the uvea thereby leading to a cats-act. In our experiments, we observed conjuncti­val congestion in all rabbits. The congestion was more after suprachoroidal injection than after intravitreal injection. The congestion in any group was comparable with the route of injection. So it can be surmised that the trauma of incising the conjunctiva prior to suprachoroidal injection was the factor res­ponsible for more congestion after this route. The cornea remained essentially clear and anterior uveitis was not present as shown by the absence of iritis, the pupil being round, briskly reacting to light and fully dilating on applying homatropine 2% eye drops. Lenticular changes in the posterior sub­capsular area were present in 60% of the eyes receiving a suprachoroidal injection of E.coli extract and in 80% of the eyes receiving an intravitreal injection of E. coli extract by the end of the period of observation. It is interesting to note that no lenticular changes were observed in any of the other eyes which received saline, C. albicans or E histolytica extract either suprachoroidally or intravitre­ally. The vitreous showed a mild to moderate flare in all the eyes injected with the extracts of E. coli, C. albicans or E. histolytica. Al­though it has been reported that intravitreal injection of horse serum produced sub­capsular changes in the posterior region of rabbit lens, but the opacities pro­duced were not well defined. Intravitreal in­jection of Shigella flexneri endotoxin has been shown to produce lenticular opacities in mice, initially in the posterior subcapsular region, but the eyes showed severe endophthalmitis and progressed to pthisis bulbi 4. It is sugges­ted that the lenticular changes produced by E. coli extract were not solely due to the uvei­tis induced, as C. albicans and E. histolytica extract produced comparable uveitis but no lenticular changes whatsoever. The toxins present seem to have acted directly in addition through the mechanism of uveitis. Our observations on the contents of sodi­um, potassium and reducing sugars in the crystalline lens and aqueous humour of the rabbits in control group are in good agree­ment with the earlier reported values. A marked increase of sodium contents in the crystalline lens after intravitreal and suprac­horoidal injection of E. coli extract is accom­panied with a decrease of this cation in the vitreous body [Table - 1]. The contents of potassium on the other hand remain unchan­ged. The sodium ions penetrate the posterior surface of the crystalline lens more rapidly than potassium. Therefore, in our study, the gain of sodium in the lens is reflected by a simultaneous loss in the vitreous body whereas aqueous humour does not show such alteration. The loss of lens potassium is sug­gested to be a late manifestation of catarac­togenesis. The contents of reducing sugars are increa­sed by about 32% and 39% in aqueous hu­mour and vitreous body respectively after suprachoroidal injections of E, coli extract ([Table - 1], p < 0.01). In vitro studies have shown the formation of cataracts when lens­vitreous preparations were incubated in me­dium containing glucose. It seems reasona­ble to conclude that the injections of E. coli extract bring about alterations in the lens en­vironment which may have harmful effects on the posterior capsule of the lens resulting in an influx of sodium ions from the vitreous body. An increase in the contents of sodium ions in the crystalline lens appears to be a typical manifestation of cataractogenesis and is known to occur in different type of cataracts and is known to occur in different types of cataracts and in the aging lens,. Lens opacities have been produced after intravitreal and suprachoroidal injection of E. coli extract in rabbits. These opacities are present in the posterior subcapsular region of the lens, which is accompanied with mild uveitis, and are similar to a picture of com­plicated cataract. The contents of sodium, potassium and reducing sugars were measured in the aqueous, lens, and vitreous about three fold in the cataractous lenses, accompanied with a decrease in the vitreous while the sodium contents of aqueous remain unaltered. The contents of potassium on the other hand, remain unchanged. An increase of 33.6% and 39.3% in the reducing sugars is observed in the aqueous and vitreous after suprachoroidal injection of E. coli extract. Suprachoroidal and intravitreal injections of C. albicans and E. histolytica extracts produced uveitis but no lenticular changes, even after a follow up of eight weeks. E. coli endotoxins seem to act directly or in combination with uveitis on the lens transparency. Becker, 0, 1876. cited in "Systems of Ophthal­mology". Vol. XI Diseases of the lens and vitreous; Glaucoma and Hypotony. Duke Elder, S. Editor. Henry Kimpton. London. 1969. p.p. 210. Pau, H., 1950, cited in "Systems of Ophthal­mology". Vol. XI Diseases of the lens and vitreous, Gloucoma and Hypotony. Duke Elder, S. Editor. Henry Kimpton"London. pp 210. Testa, M., Bocci, N. Fiori, C., Calbro, S., and Aurichio, G., 1968, Exptl. Eye. Res. 7 : 473. Shimizu, M., 1978, Folia. Ophthalmol. Jap. 29 : 562. Barber, W., 1968, Invest. Ophthalmol. 7: 564. Varley, H., 1963, "Practical biochemistry'. New. York., 1963., William-Heinmann Medical books Ltd. and Interscience books Inc. pp 33. Reddy, D.V.N. 1969, "The rabbit in eye research". J.H. Prince. Editor Spring field, U.S.A. 1964. Charles. C. Thomas. pp 362. Kinsey, V.E, and Reddy, D.V.N. 1965, Invest. Ophthalmol. 4 : 104. Kinoshita, J.H. and Merola, L,O. 1964, Invest. Ophthalmol 3 : 577. Chylack, L.T. Jr and Kinoshita, J.H. 1973, Exptl. Eye. Res. 15: 61. Adler, F.H. 1953, "Physiology of the eye". The C.V. Mosby Co, St. Luis. pp 215. Kuck, J.F.R. 1970, "Cataract formation" in Biochemistry of the Eye. C.N. Graymore. Editor. New York. 1970. Academic Press, pp 324-325. Duncan, G. and Bushell, A.R. 1975, Exptl. Eye. Res. 20 : 223. Harris, J.E. and Becker, B, 1965 Invest. Ophthalmol 4 :709.